The birds are singing and the sun is shining. I think a spring card is in order, don't you? 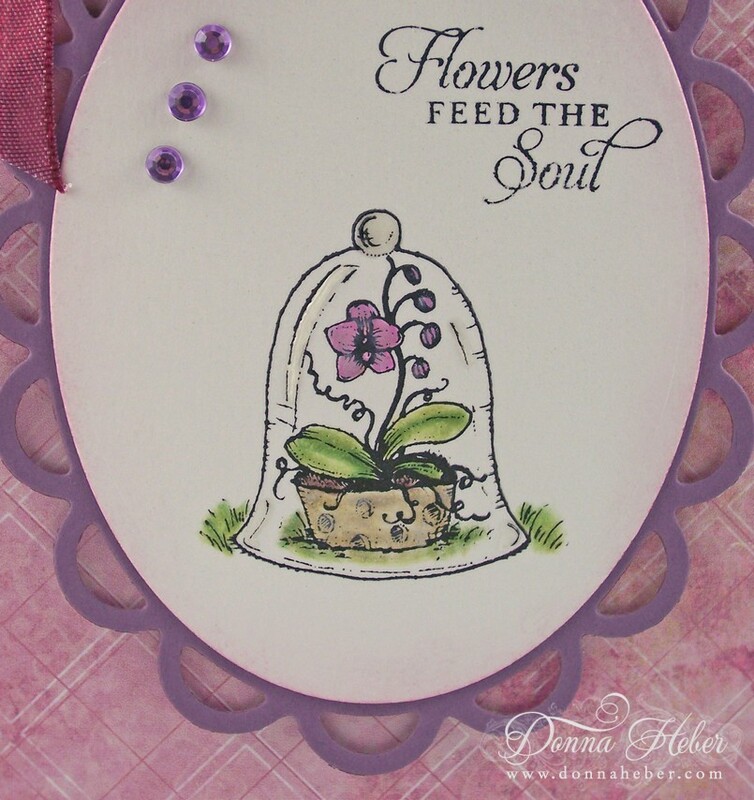 If you like cloches you won't want to miss my card giveaway the week of March 12th. The oval was cut from Shimmery White paper using Spellbinders Large Classic Ovals which I mounted onto a Lacey Oval. 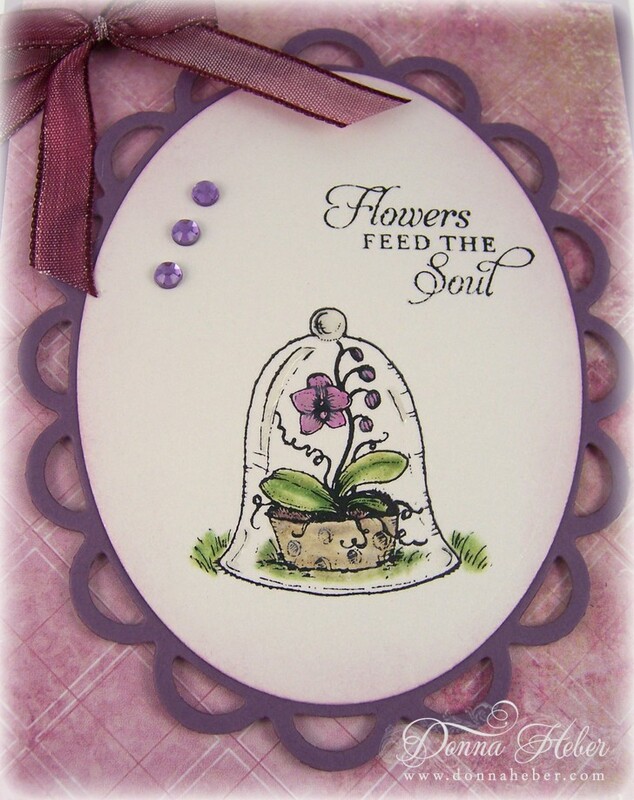 The garden cloche and sentiment were both stamped in StazOn Black. The orchid was colored in Orchid Opulence and Pixie Pink with the leaves in Certainly Celery and Garden Green. I used a blender pen to soften the colors. The pot was colored in Crumb Cake. Sponging around the image was done in Pale Plum. 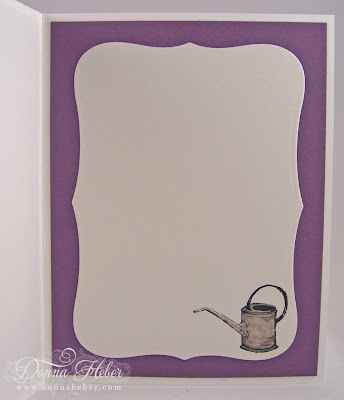 I thought the Fancy Pants Lavender Leaves designer paper went well with the Perfect Plum paper. 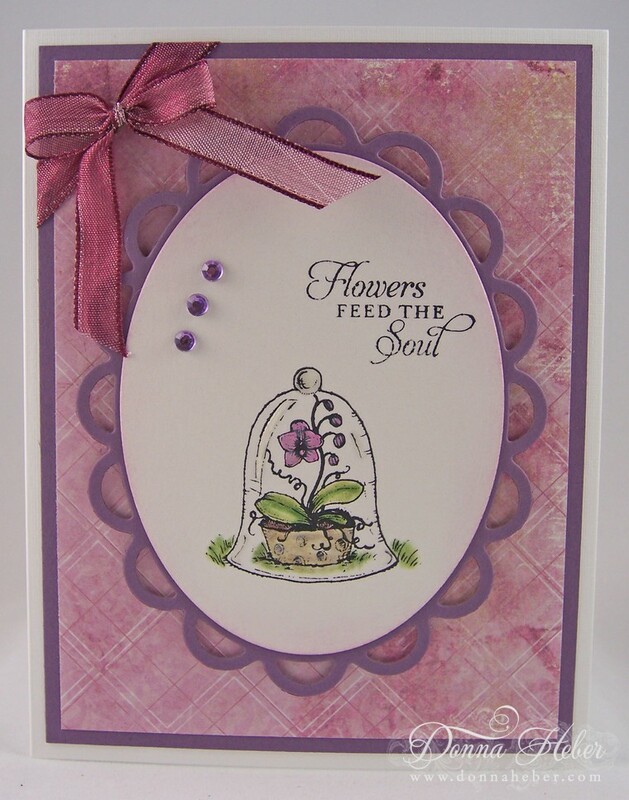 Kaiser rhinestones in lilac and a corner bow finish the card. Although you can't see it in the photo I added Crystal Effects to a few spots on the cloche since the glass would naturally have some reflections. A cute watering can was stamped on the inside and colored. I decided not to add a sentiment and leave this card blank for future use. I will be joining everyone at Make It Monday for their weekly linky party. This is gorgeous, Donna! I adore the look of your ribbon on the corner of your card! This is a beautiful card! Love popping by to see your cards! Very Pretty! 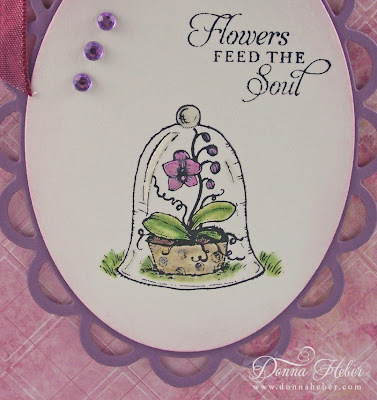 Oh my Donna, Your card is beautiful. I love the look of cloches and this image is just adorable. Super coloring and the watering can on the inside is too cute. I think I have to go shopping..
Come on spring! This card is so pretty. Makes me smile! Look at all the beautiful shades of purple you put together! Hi Donna...Love the card. Darling. Also like the hpoto of the cat with the Christmas tree inthe background. He looks SO CUTE. I love cats, don't you? Oh this is just a vision of loveliness - such a sweet color you've chosen! I love the softness to it, and of course, the gorgeous flowers which look so much like the inspiration to be found right here on your blog :) Beautiful!! Very attractive. I think last night was actually the coldest night of the year here north of Toronto. It doesn't feel like spring today. Very pretty I love cloches. This makes me happy to see. Come on Spring!!! What a pretty spring card! Thank you so much for joining us at MIM! Remember, to be in the running to win the prize from our sponsor this week just leave a comment for another entry. Be sure to mention you saw them on Make It Monday. The more entries you comment on the more chances you have of winning! What a CAS card, so pretty. Love the colors. Thank you for sharing on the MIM blog. Beautiful card design. Saw it on MIM! The image is so pretty and the three gems adds a great touch. Beautiful card. The image is so pretty and I love the purples! Very pretty card. That is such a lovely image. Visiting you from MIM. BTW - I have Candy on my Blog. cute card! love how inside part is done too! What a great idea for Mother's Day... Saw your project on Make it Monday and had to come over and take a closer look.